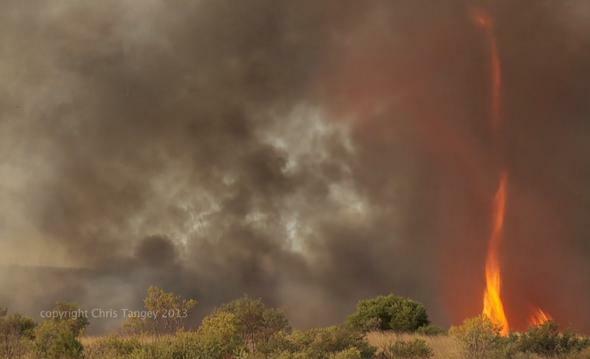 Fire tornado: Best footage yet from Australia. 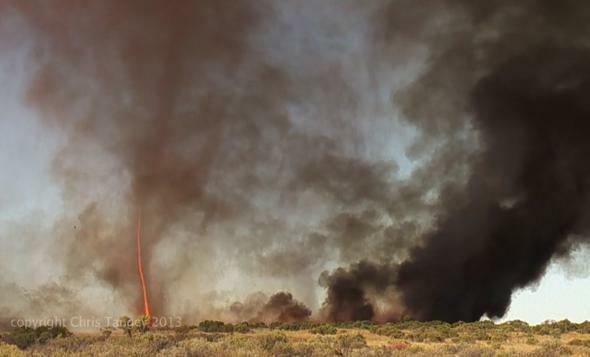 … But Does a Fire Tornado in Australia Spin the Other Way? Dorothy would’ve had a much more difficult time with this one. Last weekend I posted a video taken not too far from where I live showing a “fire tornado”—really a spinning vortex of rising air drawing its power from fire on the ground. It was pretty dramatic, mostly due to hundreds of tumbleweeds swirling around it, drawn in by the rotating column of wind. After posting it, I got a note from Chris Tangey, who specializes in photography in Australia’s Outback. He took some footage of a fire tornado in 2012 that he claimed was better than what I posted … and he’s right. Yegads. The speed and power of such a vortex depends on how quickly the air in the middle can rise, which in turn draws in air from farther out; as that air spins and falls in the rotation speeds up, tightening the vortex and magnifying it. As you can see in the fire, spurts of flame leap up the inside of the vortex, clearly giving it more strength. The sound and speed of it are enthralling. This wider view really shows how tightly focused this vortex was. I had never heard of this phenomenon until a year or so ago. But now there are cameras everywhere … and, sadly, with global warming likely increasing both the number and severity of wildfires, we’re bound to see lots more footage like this. Note: The title of this post is a joke; in general the Coriolis force only acts on far larger scales, so I would think a vortex like this (such as a dust devil) is just as likely to spin clockwise as counterclockwise. It would be interesting to see some statistic on this, though!